We are very excited to release the theme of Architecture for our latest competition! Architecture as a concept is the designing and planning of both structure and space – the resistant material and the unused, or ‘negative’ space, to reflect functional, technical, social, environmental and especially, aesthetic considerations. It requires the creative manipulation and coordination of materials and technology, and of light and shadow. We would like you to showcase the creative and artistic elements of Architecture in your images, with consideration given to space, ambiance, light, shadows, reflections, lines and curves. Encapsulate the variations and wide range of possibilities, for example, consider the way a change in the lighting affects a structure or forms a completely new perspective. Remember, photographing ‘Architecture’ has a huge variation of possibilities, giving you the freedom to play with capturing people in places, landmarks, landscapes, the exterior and interior of a structure, or just an element of it – a door, a window, a chimney. Nick is a retired corporate communications and marketing manager having worked in senior positions in the telecommunications and energy industries. He lives in Norfolk. He has been making pictures for 50 years having started out with a Kodak Instamatic when he was 12 years old. Although having successfully moved from darkroom to the digital environment, he does still use a medium format film camera from time to time. 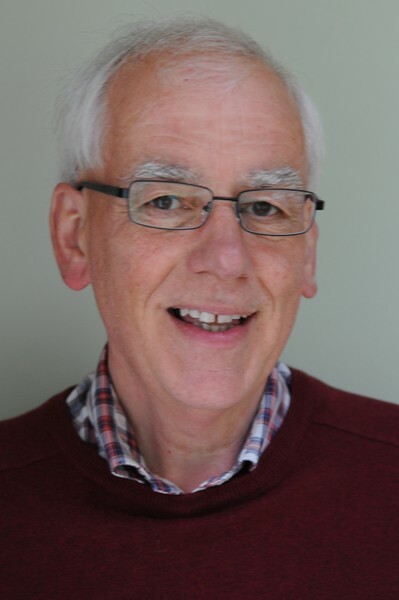 He has been involved in and competed at local camera clubs since the 1970s and is the Competition Secretary and Vice Chairman of North Norfolk Photographic Society and a camera club judge on the East Anglian Federation of Photographical Societies circuit. Although experimenting with many genres of photography his first love is monochromatic images that capture the light and atmosphere of the British landscape and also in photographing macro natural history subjects. He actively participates in national and international exhibitions. "The composition is very strong with the photographer choosing a viewpoint so that the three buildings frame the picture separated by the sky. The clouds are blurred by a long exposure. The buildings each have different patterns and textures creating interest. The exposure has been handled well. For me the image conveys a juxtaposition between the solidity of the City and the rushing outside world represented by the clouds." "I was immediately drawn to this image. The photographer's choice of viewpoint uses the diagonal and curved lines of the building leading the viewer to the focal point at the top of the frame. The different patterns in the surfaces add interest to create a strong composition. This picture is all about light and shape and works very well in monochrome." "The moody lighting and pools of water make this a dramatic shot. The photographer has chosen a low viewpoint that encompasses the reflections . The composition is well balanced with the campanile positioned on the 'thirds'. The buildings, reflections and clouds giving strong lead-in lines that focus the viewers attention." "A simple imaginative viewpoint that creates an almost symmetrical image that is close to monochromatic and uses areas of soft focus well." "A really simple composition that is full of contrasts - in the colours; in the horizontal and vertical lines; and even one window with the blind closed and the other open. Very effective." "The contrasting colours, reflections, angles and lines make this image. The photographer has managed the tonal range of the subject very well." "The trees, buildings and spokes on the wheel all lead the viewer into the hub of the 'eye'. The artificial lighting makes the image ethereal and very different to the regular images of the London Eye."